The Side jacket rack is mounted on one side only (either left or right) so is not affected by wardrobe width. The robust aluminium runner, with three profiles sliding on ball bearings, pulls out fully and has a high load capacity. Its depth maximises the amount of usable space. 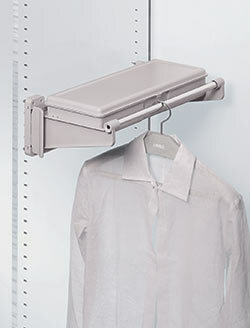 Each jacket rack is fitted with a chromium plated tube for hanging clothes and a lidded drawer. The plastic parts are in grey ABS, the runner is in silver anodized aluminium.